Guns are the only consumer products in the United States not regulated by the federal government for health and safety. Facing long-term declines in household gun ownership, the gun industry exploits this unique exemption by designing, manufacturing, and marketing increasingly lethal and militarized products for sale to the general public. The deadly, tragic results are seen every single day, from high-profile mass shootings that make headline news, to homicides, suicides, and unintentional deaths that quietly devastate families and communities. The VPC’s research educates the public on the full spectrum of militarized products designed, marketed, and sold by the firearms industry: from assault weapons, to 50 caliber anti-armor sniper rifles, to compact, high-capacity pistols specifically designed for concealed carry in public. Our research reveals how gun industry marketing practices exploit the military pedigree of these products including their use in combat, appealing to the worst elements of America’s gun culture. Through its Cross-Border Gun Trafficking project, the VPC also reveals the types of weapons favored by illegal gun traffickers moving weapons from the United States to Mexico and other Latin American countries. 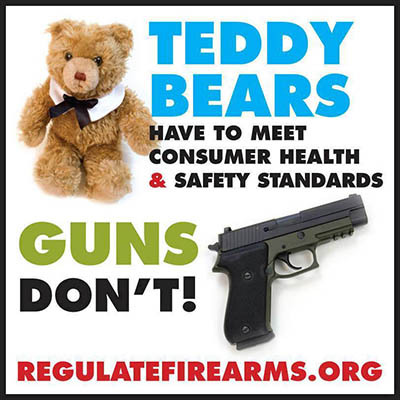 Teddy bears, household appliances, prescription drugs, and motor vehicles all have to meet federal health and safety standards in the United States. But guns don’t. The solution is clear: Regulate firearms for health and safety as we do all other consumer products.